In the final stretch of my winter break from college, I traded the warm weather of Florida for the more seasonably appropriate weather of North Carolina so I could visit my aunt and uncle. In driving the distance between the two localities, Savannah, Georgia proved to be the best place to find many gluten-free options for lunch. 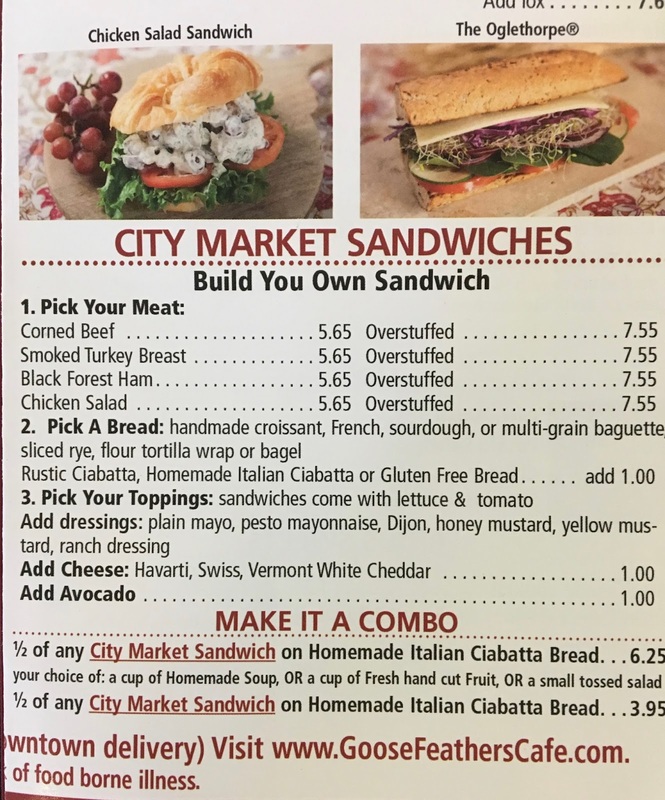 After comparing several options, I decided upon Goose Feathers Cafe because they offered something simple that's hard to find gluten-free: a deli sandwich. 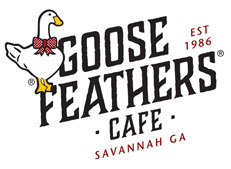 Goose Feathers Cafe, now in its 31st year, is a cute, bustling cafe that offers the best of breakfast and lunch in a delicious brunch service all day. Although many items- especially their artisanal baked goods- are not safe, what options they do have for gluten-free guests are worth taking note. For gluten-free customers, menu items are limited to those that involve bread or a bagel. Gluten-free notations on the menu are limited. Staff are very helpful though with pointing out options, and when you let them know you're an "allergy" order, they'll make your meal in a separate area of the kitchen with dedicated utensils. 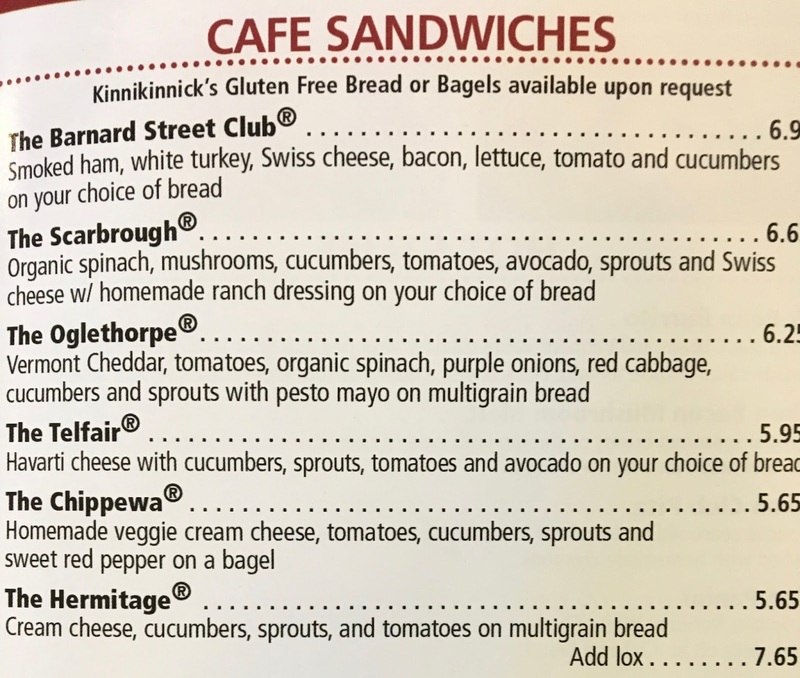 Goose Feathers Cafe uses Kinnikinnick bread and bagels, which are gluten, dairy, and nut-free. Some varieties contain egg, corn, or other allergens, but I did not ask exactly which breads and bagels Goose Feathers uses. When an allergy order is flagged, the breads are not toasted, because they have a shared toaster, but a bagel can be microwaved if desired to heat it up. I was okay with non-toasted bread for my sandwich so I did not exercise that option. 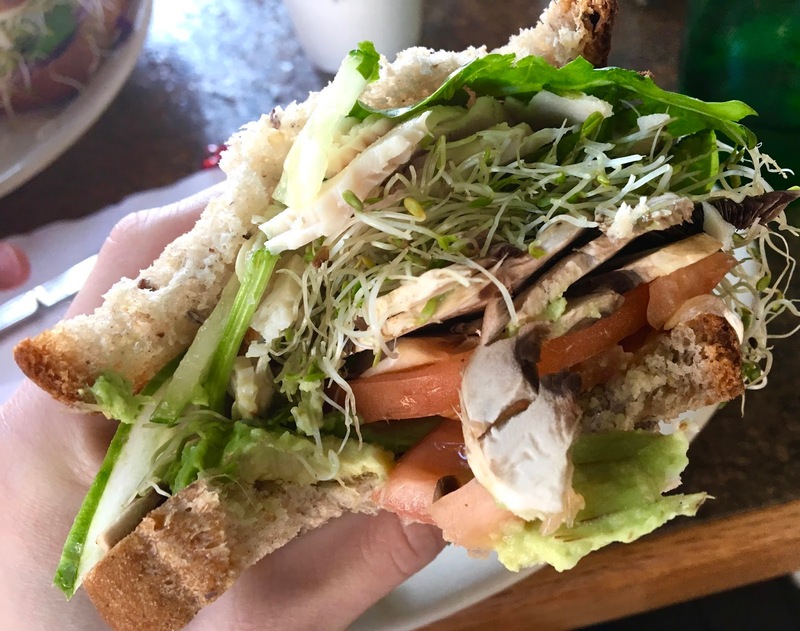 I ordered the Scarborough sandwich, which comes with spinach, mushrooms, tomatoes, avocado, and sprouts. I asked them to omit the cheese and mayo that normally comes with the sandwich, and added turkey for extra protein. All sandwiches come with a deli pickle, which is salty, tangy- exactly what a deli pickle should be. The sandwich was really, really good because it had so many different flavors and textures working together. 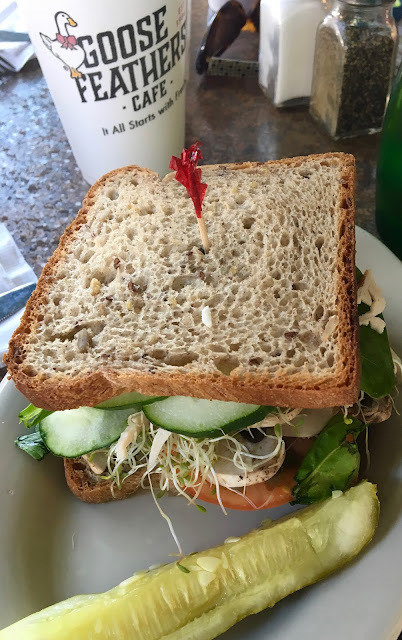 The vegetables and turkey were stacked high, which made eating the sandwich a tad messy, but I have no complaints, because so often gluten-free sandwiches are so sad and skimpy. The vegetables were all fresh, and the bread was soft and multigrain, it dutifully held the toppings until the end, and had a pleasant "normal" taste and texture. My only regret was not switching mayo for mustard, because it could have used a sauce to tie in all the toppings. Even without that, the sandwich was perfect, and made me wish that more restaurant served gluten-free deli sandwiches like this. It's such a luxury to eat out and enjoy one. After eating the sandwich, I wanted an extra salty snack, so went back and ordered a bag of potato chips. Goose Feathers Cafe has Metro Deli and Miss Vickie's chips on hand, but I selected the former because the latter's flavored varieties have lactose and/or buttermilk in them. 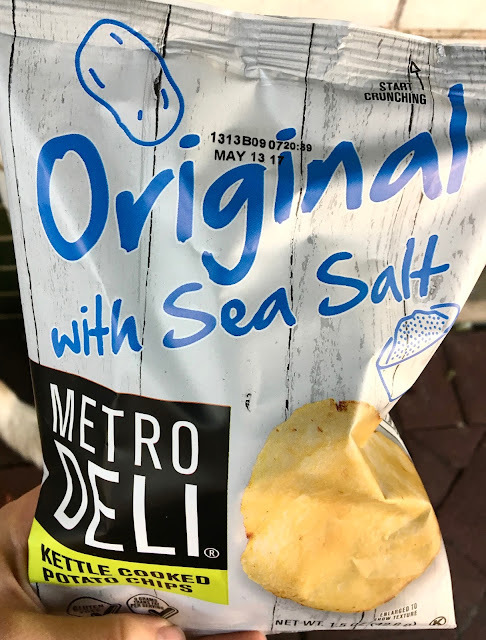 Metro Deli's chips were clearly marked gluten-free and had three simple ingredients: potatoes, oil, and salt. They were crunchy, not too salty, and a great finish to the meal (and I'm not normally a potato chip fan). I really loved Goose Feathers Cafe. The food was delicious, and the location is prime, conveniently located downtown near historical attractions and the waterfront. Sitting outside on the bustling sidewalk, it was fun to observe various tours go by, and a vibrant mix of locals and tourists enjoying the beautiful day. 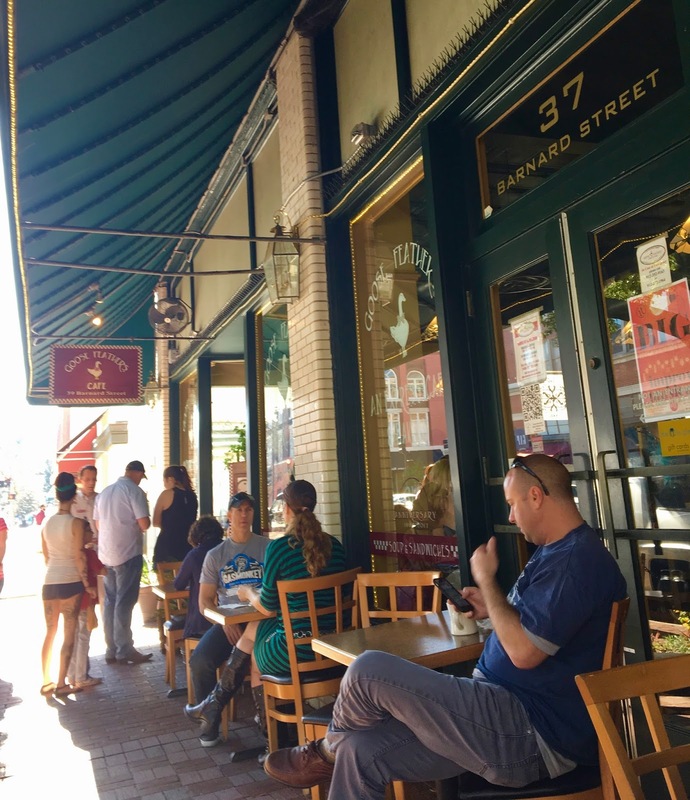 Although I was only in Savannah an hour or two, the experience definitely made me want to return and see more of the city and its foodie scene.